You provide your information once, we'll get you listed across 20+ sites - saving you hours. Need to change your information? No problem! We'll push the updated information to all listing sites, ensuring accurate information across the web. Monitor where you're getting leads, how people are finding you and understand performance across search engines. Why should I get listed? 3 out of 4 online customers use a search engine to find businesses. You can improve your business's SEO by showing up in local searches. Claiming your business ensures you're the only authorized person to edit the listing. On average, completed listings get 7 times more clicks than empty listings. Easy. Impactful. Pays for itself. 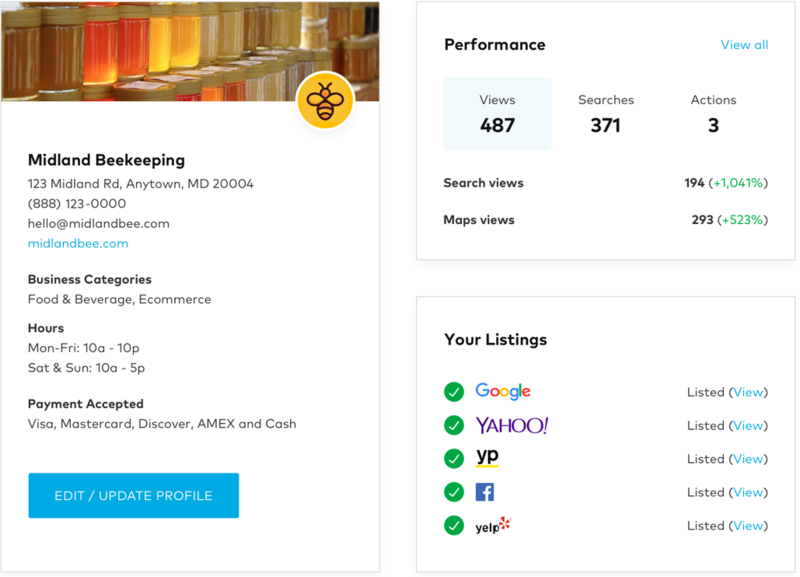 Whether you are looking to find new customers, manage your listings or both, search engine listings manager is a low cost option that suits your needs. So you can get back to running your business. Does my business need a physical location to be listed? No, you should get your business listed even if you don't have a physical location. Just make sure to select our option to hide your address from the public.
? Are there additional fees? Your business will be listed across search engines and you can change your profile as many times as you want – we'll resubmit all your information immediately. You'll also have access to your dashboard to monitor performance. We won't charge you any additional fees. Do I need a website to get listed online? No, you don't need a website. You can list your business name, phone number, and address for people to find. If you're interested in getting a website, check out our builder. What if I’m already listed? It’s OK if you're already listed! We'll sync your business information so it's consistent and you can manage all your listings from one place.